Yesterday, we took another trip to St. Louis for EL. This time, we had a consultation with a Neuro-Oncologist. When I first heard that title, it scared me a bit, because I automatically think of an Oncologist as someone who treats cancer. However, when the nurse practitioner set up the appointment with us, she told us this type of doctor treats ALL kinds of lesions in the brain, whether they are cancerous or not. So, because of EL's enlarged pituitary gland, we were referred to him, and he will most likely be our main contact from here on out regarding any future treatments. The doctor and his assistant shared with us that all of EL's blood work from two weeks ago came back good. So, praise the Lord for this great news! They also showed us the pictures of the enlarged pituitary gland and said it is not acting like a fast-growing tumor. Again, that is great news! We still do not know exactly what the lesion is. So, for now, we will just wait and watch. In about a month, we will return for another MRI to check and see if there is any enlargement. The last one we had done was in August, so that will make them 3 months apart. Until then, we carry on as usual. 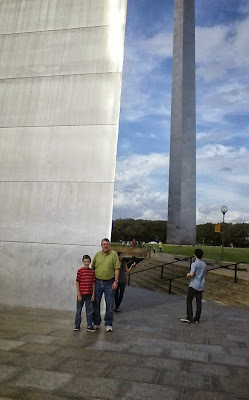 It was such a beautiful day so, after the appointment, we took a quick visit to the St. Louis Arch. 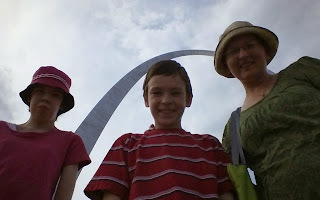 The Visitor's Center was closed, but we enjoyed getting a close-up look at this "gateway to the West." Great news! I'm sure that waiting and watching is not easy though! I'll keep praying! Thankyou, Sylvia. You are right - the waiting and watching is not easy either. We are ready for this to all be behind us. How wonderful to hear this good report! Thank you for sharing!